I delivered a workshop in Sweden recently where the team were spread across multiple time zones, in different continents, operating in different languages and markets. The company had found themselves with a whole new marketing team due to exponential growth. 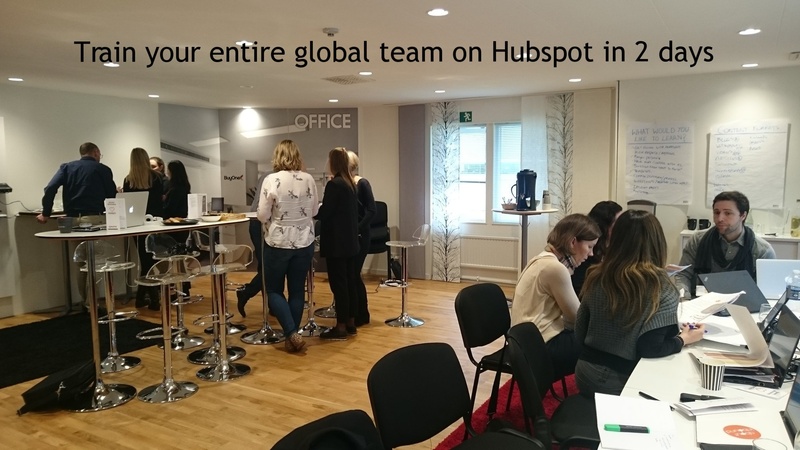 The challenge was to get all the new hires trained up and the entire global team working cohesively and productively.As part of a week long induction and team building I was invited to deliver a 2 day training on Hubspot tools and best practices. Most companies I work with face similar challenges. You may even fall into one of the below categories. For each of the above you might need to apply a slightly different approach. However, the quicker you ramp up your team. The quicker you will see results and reduce the time to productivity. So what is the best strategy is for you to adopt in your business in order to quickly train your team up on Hubspot? Well, I have outlined below some free resources to get you started and a suggested approach. One of the great things about Hubspot is the amount of free resources available. Outlined below are some of the main resources available for training purposes. You can pick and choose topics from the above list for a 2day time frame. I would suggest at least including the marketing software & inbound marketing certification. These resources are great however, they do take time. The time that you might not have for a global roll out. The academy training is all self-paced. According to Harvard only 4% of people who register for online learning courses actually complete them. This is obviously much higher within a corporate setting. However, can you guarantee your entire team will learn what they need to from self-paced learning within the desired timeframe? Who will manage this process and where do you start? You definitely, would not need to complete all of the above to be proficient in Hubspot tools and Inbound best practices. Knowing where to start and how to navigate the resources to match beginners and improver levels are key. Start with your business goals? As with anything, it is essential to focus your efforts when it comes to Inbound Marketing. However, it is especially needed when it comes to training. Otherwise, you will be subjecting staff to overwhelm. It is not essential to learning everything at once to be successful with Hubspot. What are your short term goals? What do need to achieve in the next quarter? e.g. do you have a trade show coming up or a webinar planned. Do you have specific metrics you need to reach? Start with a small campaign, that is easily measurable with specific constraints and build from there. Below is a sample structure to implement Hubspot. Depending on the team one person could have multiple roles. Will team members be overextended if they have to deliver globally or across multiple Hubspot portals? It is vital that you ensure you have the right resources in place. You may also want to consider outsourcing elements of these tasks to start with so you can ramp of faster. What do they need to be trained on? 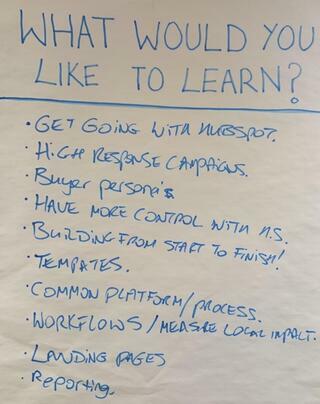 What is your teams level of Inbound knowledge? Do they need more tool-based training or an understanding of best practices? Do you need to have training on agreed internal process for implementation such as naming conventions and folder structure? As part of a development plan, you may want to create a matrix structure of beginner, intermediate and advanced skills. So new hires can bridge the gap over time and self-assess what they need to focus on developing in. 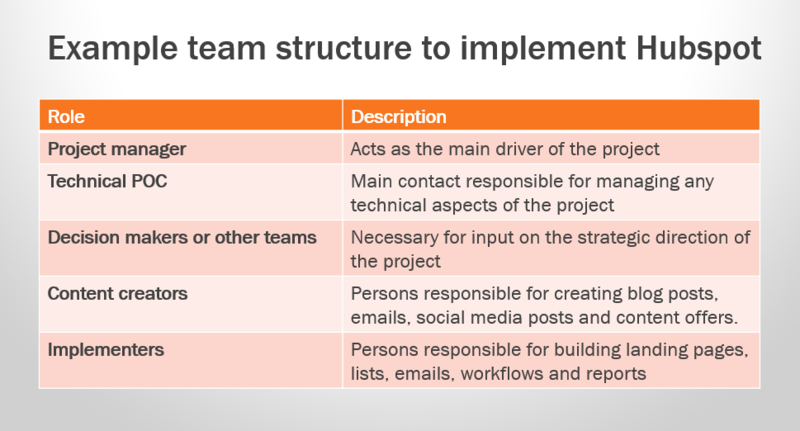 How are your teams structured? Do you have field marketing teams and a centralized structure or by specialty, division, product or region? So, what is the best way for your team to be trained quickly? In my opinion, the quickest way to amplify initial learning across global teams and ensure alignment is to get everyone together to deliver in-person training. Within 2 days you can cover both tool based learning and best practices on subjects to be sufficient in creating your first Hubspot campaign. This is particularly useful if you have lots of new team members or if your entire team is new to Hubspot. After your team are comfortable with the basics, map out a development path with the self-paced training resources to ensure continued learning and success. I would love to know your approach to training global teams? Where do you start? What is your approach, what works well? Let me know how you get on in the comments below.